We specialize in the Architectural Design of high performance buildings. Our projects measure their green building performance using LEED and Passive House certification standards while striving to meet the Living Building Challenge. The architectural style of our buildings reflect the environment and the era in which they are constructed. Functional & Spatial Programming, Building Code Analysis, Feasibility Studies, Conceptual Designs, Detail Design, Landscape Design, Physical Models, Digital Models. 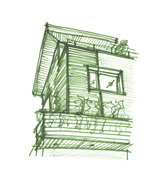 Review a detailed outline of our Green Home Design Services.